NEW YORK (CNNMoney) -- General Electric reported higher first-quarter earnings and revenue Thursday, topping analysts' estimates. The Fairfield, Conn.-based industrial conglomerate logged earnings of $3.4 billion, or 31 cents per share, up 48% from a year earlier. Analysts polled by Thomson Reuters had expected earnings of 28 cents a share. "As today's results show, GE has emerged from the recession a stronger, more competitive company," CEO Jeffrey Immelt said in a press release. 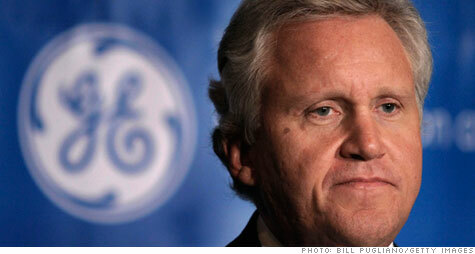 Immelt attributed the growth to GE's health care, transportation and aviation businesses. GE Capital, the company's banking division, earned $1.8 billion after tax, more than triple its year-earlier results. The company's biggest division is still recovering from the huge losses suffered during the recession. GE's energy infrastructure business, which accounts for roughly a quarter of overall revenue, reported a 7% decline in earnings -- but Immelt said he expects that business to "return to growth in the second half of this year." Overall revenue came in at $38.4 billion, exceeding expectations for $34.6 billion. The company also raised its quarterly dividend for the third time in a year -- this time by one cent, to 15 cents per share. GE shares declined 2.2% in early trading. GE (GE, Fortune 500) has recently been under pressure, facing criticism about its 2010 taxes and its role in the nuclear crisis following Japan's March 11 earthquake. GE designed all six nuclear reactors at Japan's crippled Fukushima Daiichi nuclear power plant. "Our teams are working diligently to support our customers in Japan," Immelt said in a conference call with investors. 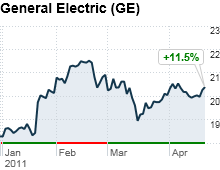 GE reported a tax rate of 53%, up from 16% in the year-ago quarter. Immelt attributed some of that increase to taxes on GE's NBC Universal sale earlier this year. During the first quarter, GE sold a major stake in its NBC Universal media unit to cable giant Comcast, whose programming includes E!, the Style Network and several cable sports stations. The new venture, called NBCUniversal, LLC, is now 51% owned by Comcast (CMCSA, Fortune 500) and 49% owned by GE. GE said three quarters of the profit it earned on the deal was wiped out by restructuring costs.